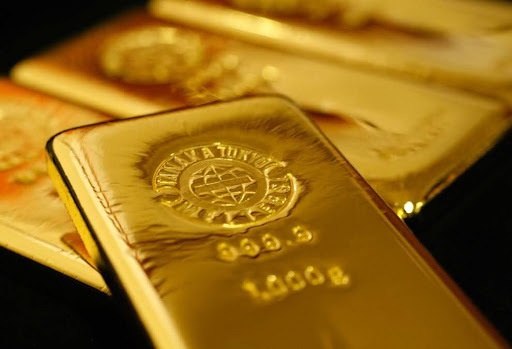 Sought after since the beginning of recorded history, gold remains a highly valued metal, reaching record highs recently, climbing over 135% in value in the past year alone. 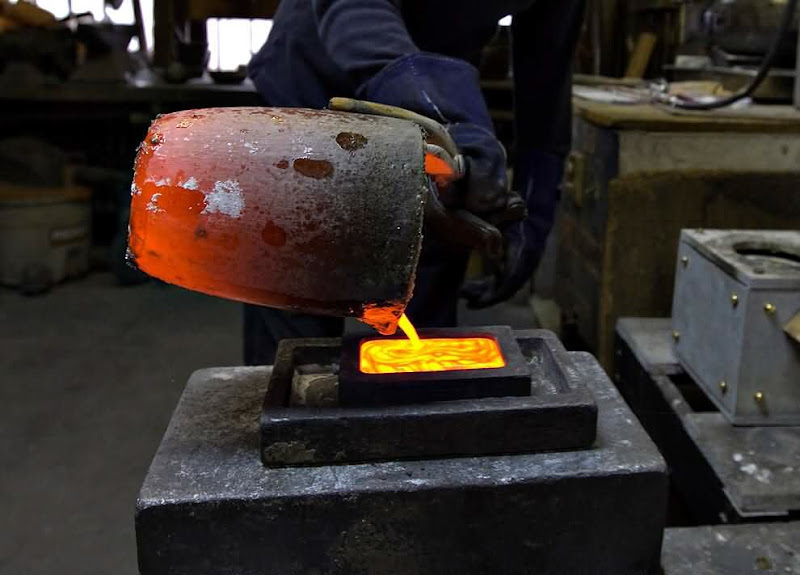 The recent rise in the price of gold comes just as annual worldwide mine production has decreased - down by nearly 8% since 2001. 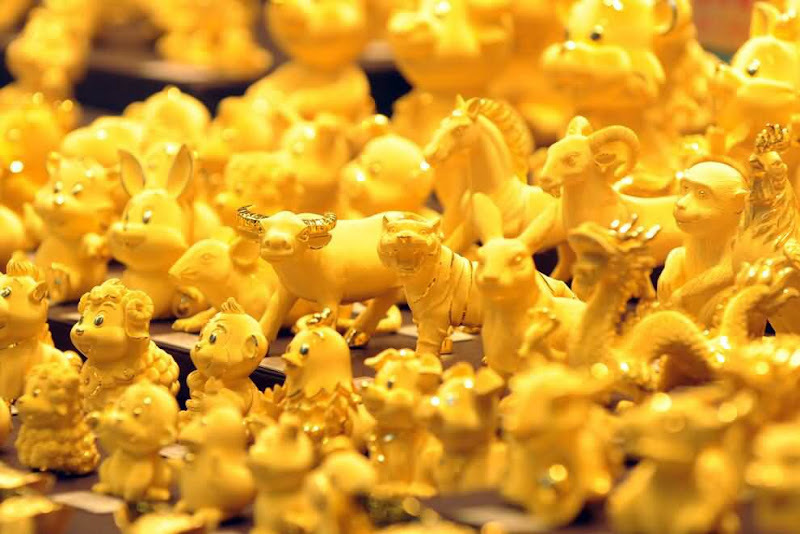 In human history, only 161,000 tons of gold have been mined - more than half of that extracted in just the past 50 years. 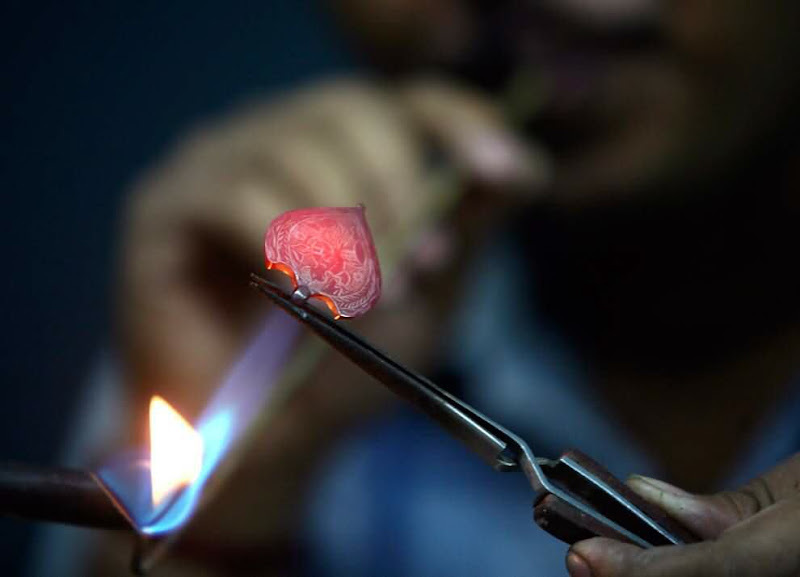 Collected here are a handful of recent photographs of people searching for, mining, rediscovering, celebrating, buying and selling gold. 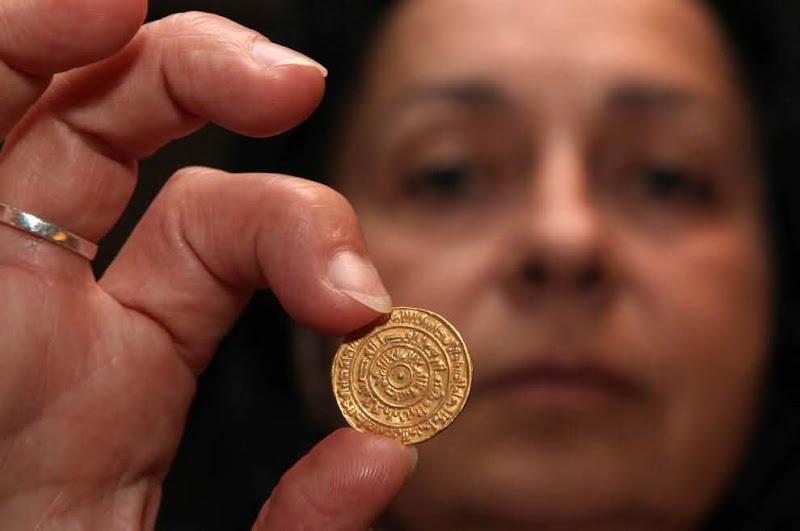 Hava Katz, the head of the national treasures of Israel's Antiquities Authority, holds up a 1,000-year-old gold coin minted in Egypt and dated 1,095 AD, supposedly brought to Jerusalem by Muslim pilgrims, during an exhibition at the Davidson Archeological center in Jerusalem's Old city on November 11, 2009. A statue of a bird of prey made of gold is pictured at a gold and silver exhibition at the Ginza Tanaka store in Tokyo October 23, 2009. 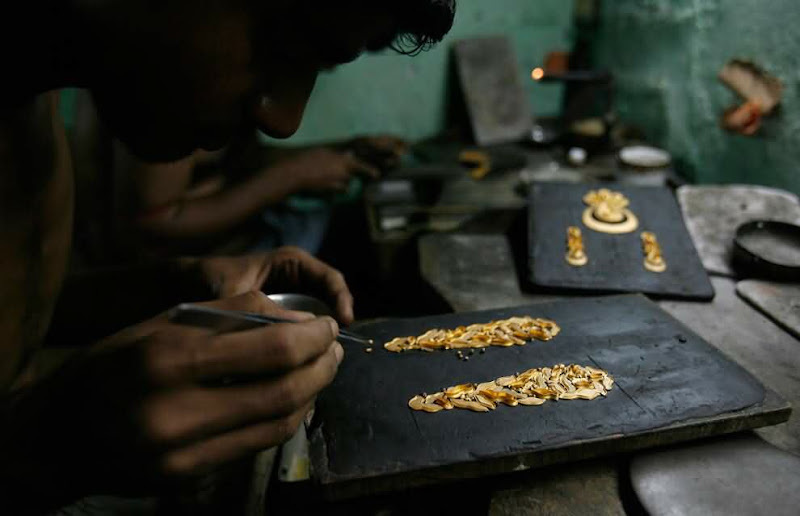 An artisan makes gold ornaments at a jewelery factory in the eastern Indian city of Kolkata November 13, 2009. 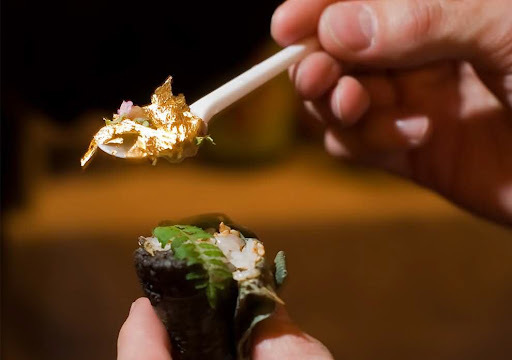 A man holds a spoon full of gold leaf, ready to eat it with his sushi at the "Seven Sushi Samurai" Sushi of the Year awards 2009 at the Olympia exhibition center in west London, on November 14, 2009. The gold leaf was an ingredient in last year's winner Mitsunori Kusakabe's entry. Children from the Turkana area of Kanukurdio pan for flakes of gold which helps sustain their families on November 9, 2009 near Lodwar, Kenya. Trays with gold ingots are placed in a room for final weighing and packaging at the Krastsvetmet plant in the Siberian city of Krasnoyarsk November 16, 2009. A pure gold statue of Buddha is displayed at the Ginza Tanaka store in Tokyo November 26, 2009. 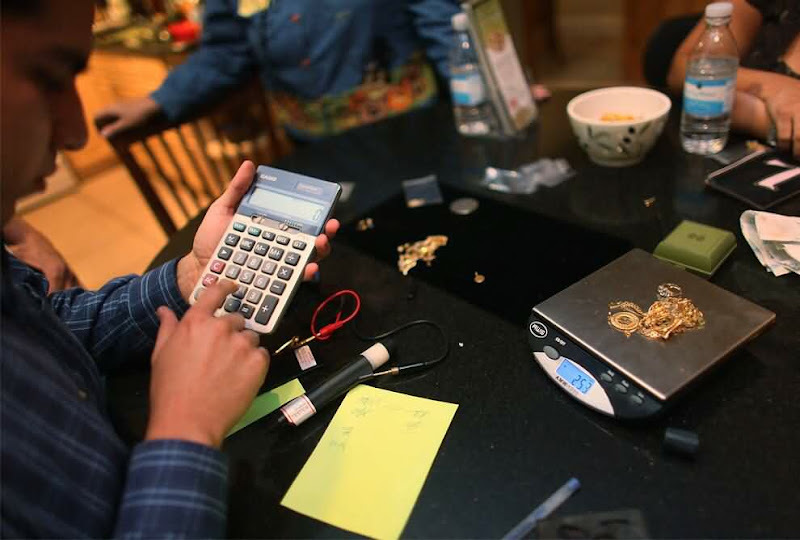 Pedro Linares uses a calculator to determine how much the company he works for, Fast Cash Gold Parties, will pay for the gold jewelry that he is weighing on October 30, 2009 in Hialeah, Florida. 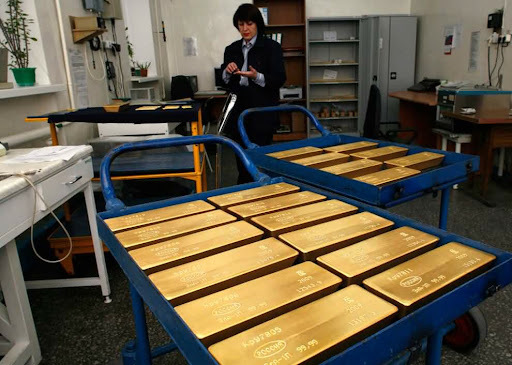 As the price of gold remains high, the company is busy setting up these modern day Tupperware parties to buy people's unwanted gold in their homes. Gold figurines on display in a shop window in Hong Kong on November 17, 2009. 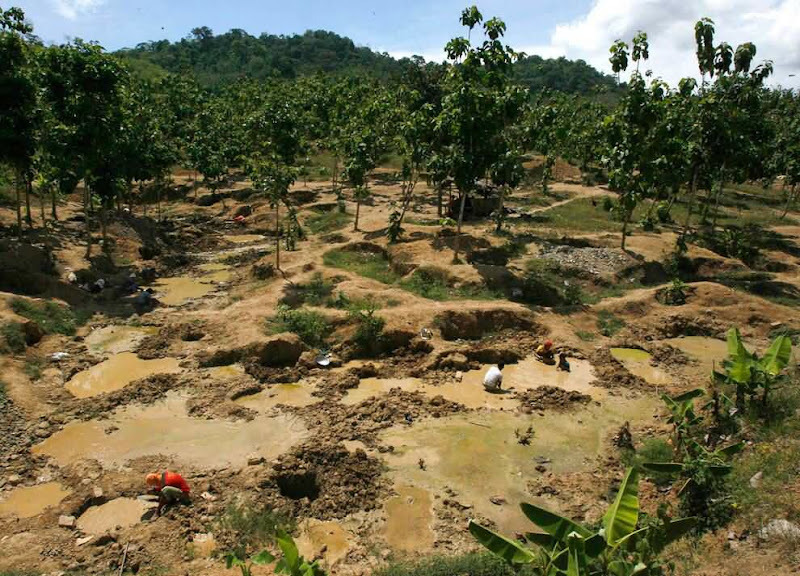 Colombian gold prospectors mine for the precious metal on the river Dagau, Zaragoza province, Cauca, Colombia on November 17, 2009. 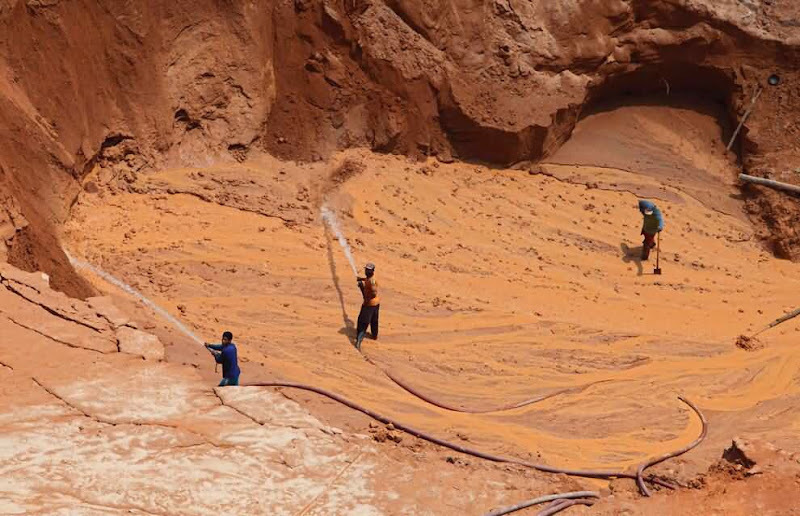 About 8,000 gold prospectors work illegally on the Dagua river to support their families, local authorities said. 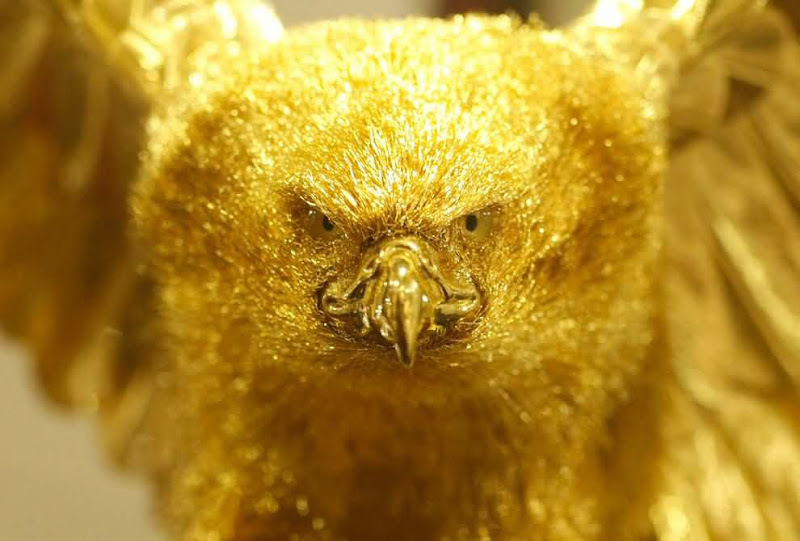 A gold trader weighs gold in Cauca, Colombia on November 17, 2009. 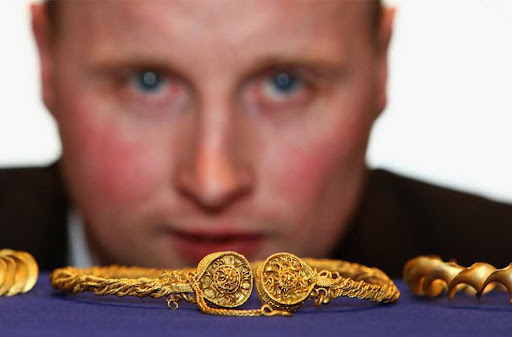 Metal detector enthusiast David Booth poses with his hoard of Iron Age Gold on November 4, 2009 in Edinburgh, Scotland. 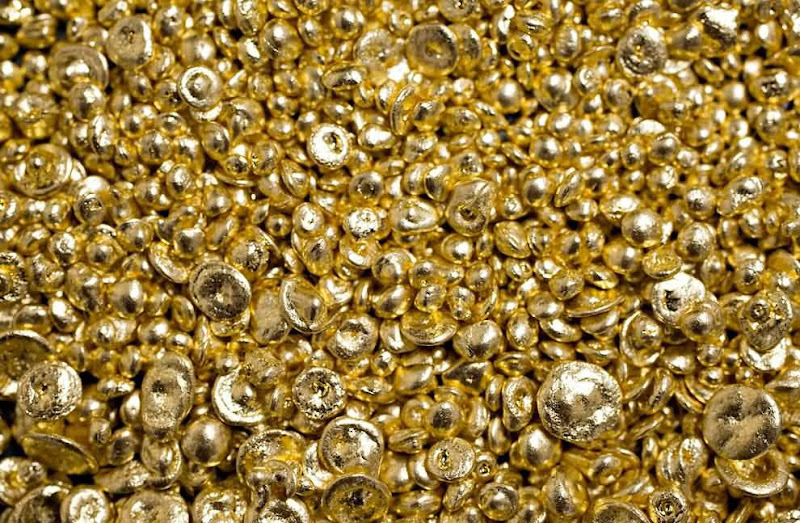 Booth discovered the gold Iron Age torcs buried on on private land in Stirlingshire - the items dating from between 300-100 BC. The hoard is currently under protection of the Treasure Trove Unit, under Scottish law, the Crown can claim any archaeological objects found in Scotland. 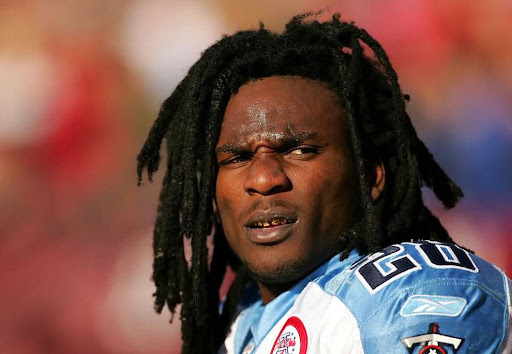 Gold-toothed football player Chris Johnson of the Tennessee Titans sits on the bench during their game against the San Francisco 49ers at Candlestick Park on November 8, 2009 in San Francisco, California. 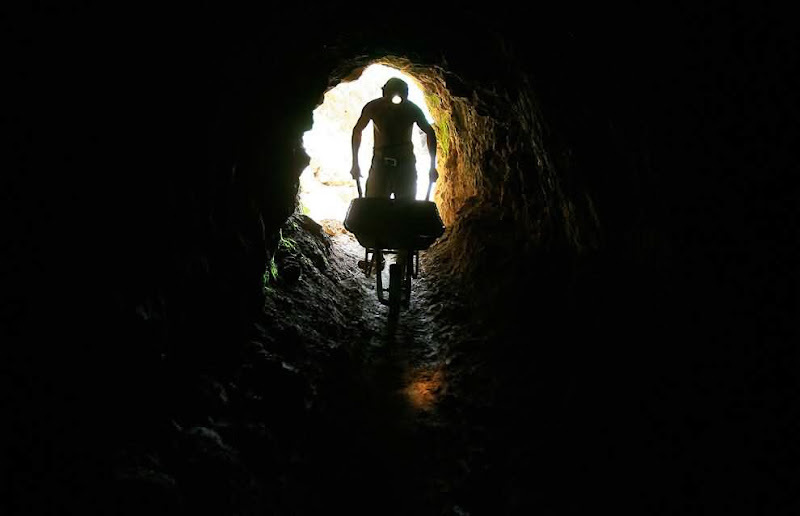 A gold miner pushes a wheelbarrow to carry rocks which will be processed for gold in an artisanal mine in Abangares, north of San Jose, Costa Rica on December 9, 2009. 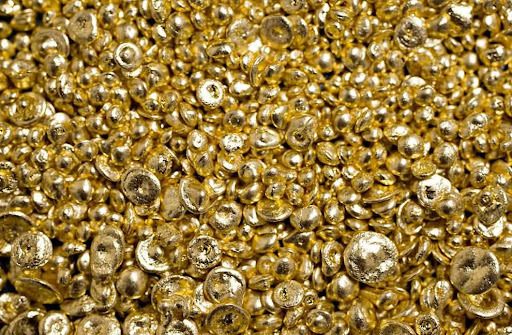 Costa Rica is pushing to legalize a 600 informal miners of small-scale miners who scrape out tiny amounts of gold from abandoned mine shafts using dangerous and polluting techniques. People work in an illegal gold mine in a national park forest near Novo Progresso in Brazil's northern state of Paral on September 15, 2009. 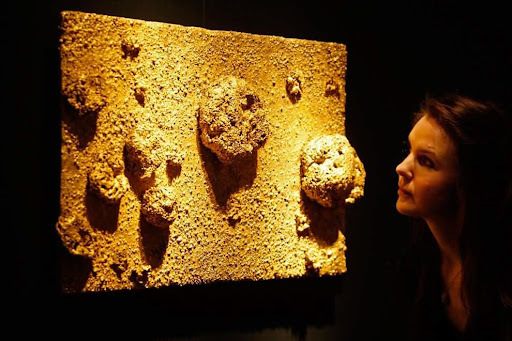 A Christie's employee looks at a creation "Relief Eponge" by Yves Klein on display at the auction house in London, Wednesday, Jan. 20, 2010. The gold sponge relief creation is to be auctioned at the "Post-war and Contemporary" sale on Feb. 11 with an estimated price of 5.7 to 8 million euros (US $8.2 to 11.4 million). 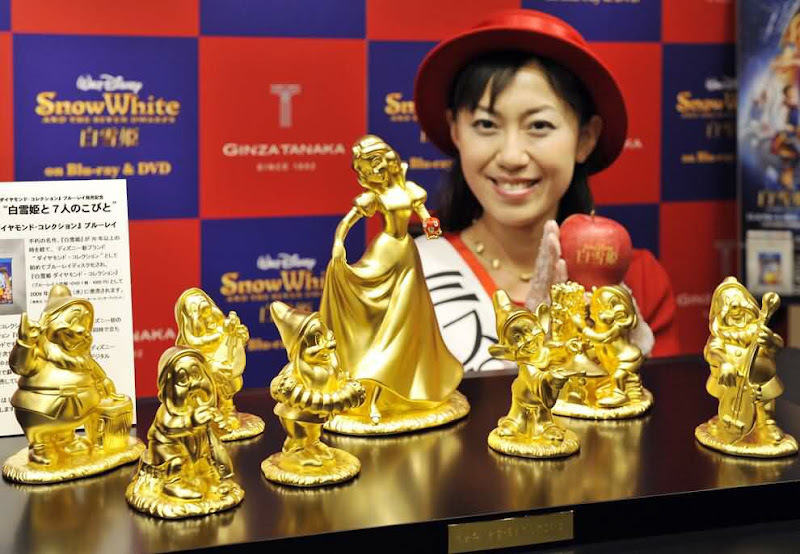 A model displays pure gold Disney character dolls showing Snow White and the seven dwarfs, priced at 30 million yen ($300,000 USD) and produced by Tanaka Kikinzoku Jewelry in Tokyo on November 4, 2009 for the promotion of Blu-ray disks of Disney movies. A Caterpillar Inc. mining truck moves along a road at the AngloGold Ashanti Ltd. Cripple Creek & Victor gold mine in Victor/Cripple Creek, Colorado, on Thursday, Nov. 5, 2009. 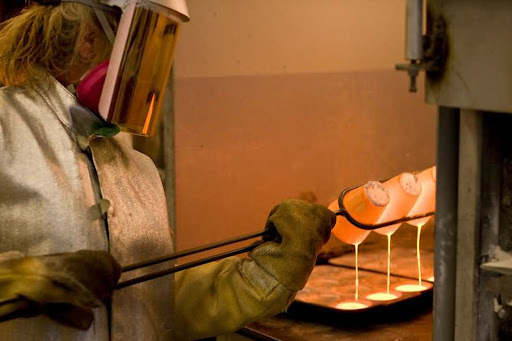 AngloGold Ashanti Ltd., Africa's largest gold producer, purchased Golden Cycle Gold Corp. in January 2008 to gain full control of this mining site, its only active operation in the U.S.
Sharon Brumley pours fusion samples into cone molds to determine the total gold content in a sample at the AngloGold Ashanti Ltd. 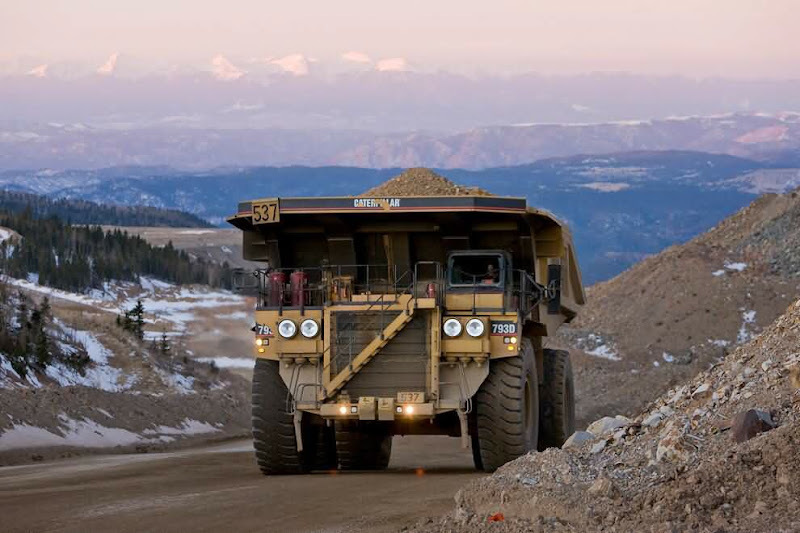 Cripple Creek & Victor gold mine in Colorado on Thursday, Nov. 5, 2009. 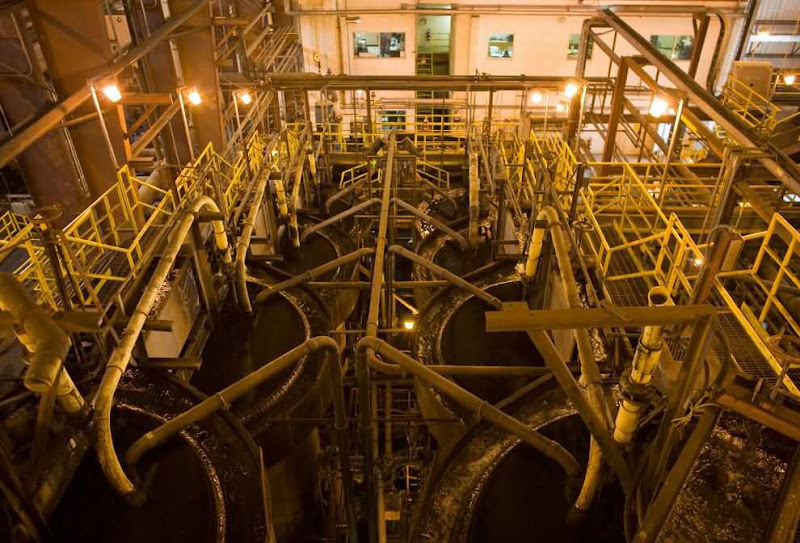 A carbon recovery circuit adsorbs gold in a sodium cyanide solution at the AngloGold Ashanti Ltd. Cripple Creek & Victor gold mine in Colorado on Thursday, Nov. 5, 2009. 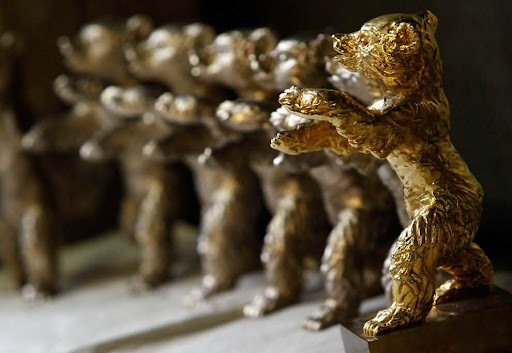 Gold-plated Berlin Bear awards are lined up for the upcoming Berlinale International Film Festival at Noak bronze foundry in Berlin January 20, 2010. A worker holds a geological core sample containing copper and gold to visitors at the Oyu Tolgoi mine site in Khanbogd village, Umnugobi province, Mongolia on Saturday Nov. 7, 2009. 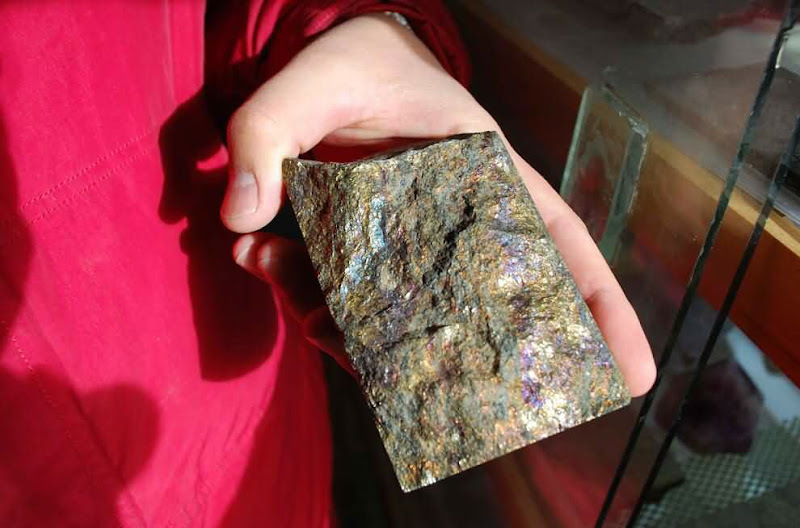 Mongolia is trying to capitalize on its vast mineral wealth to help the country lift itself out of poverty. A woman wades deep under a river bank to collect mud to pan for gold in Pidie district in Indonesia's Aceh province November 2, 2009. 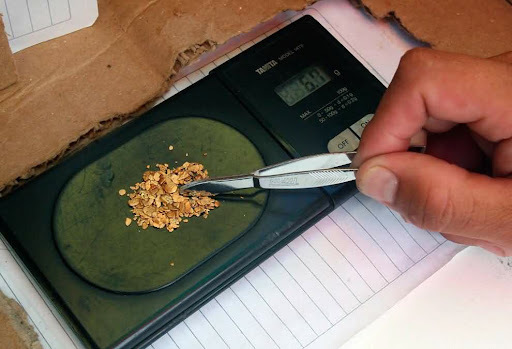 Residents in the area engaged in traditional gold mining can get about 1.5-2 grams of gold and earn 275,000 rupiah ($28) per day. A villager looks for gold dust from sand along a river at Pidie district, Indonesia's Aceh province November 2, 2009. 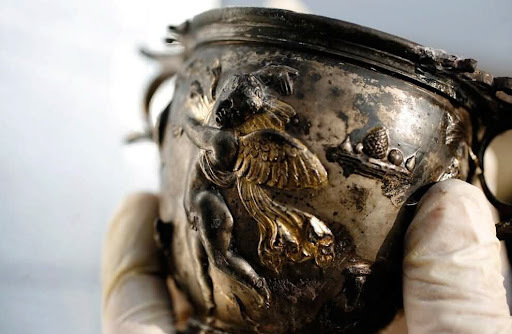 Bulgarian archaeologist Veselin Ignatov holds a gold-plated silver cup with an image of the Greek God of love Eros, found at a Thracian mound near the village of Karanovo, Bulgaria on November 17, 2009. A team of archaeologists led by Ignatov found a chariot, two silver cups, golden rings and jewelry, clay and glass artifacts dating back to the first century A.D. Illegal miners search for gold on the mountain of Tumpang Pitu in Banyuwangi, East Java, Indonesia on November 21, 2009. The mine has been in operation since June 2009 and local villagers have began protesting because the waste produced by the mine is polluting the environment. An illegal miner pans for gold at the mountain of Tumpang Pitu in Banyuwangi, East Java, Indonesia on November 21, 2009. 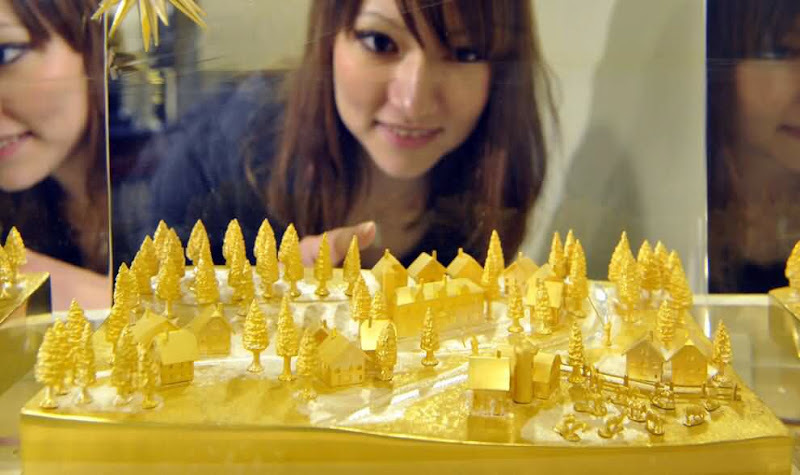 A Japanese girl admires a gold model named "Wishing to shooting stars" at a gold and silver craft exhibition in Tokyo on October 23, 2009. 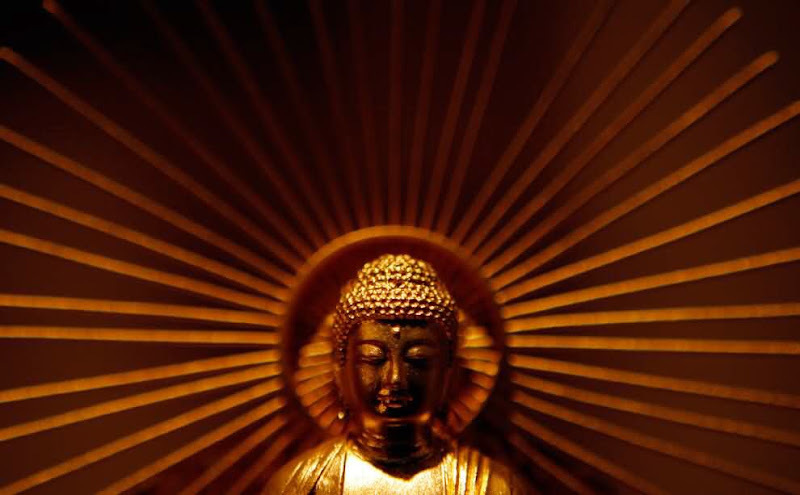 The 30cm-tall, 15kg pure gold artifact is worth 130 million yen (US $1.3 million). 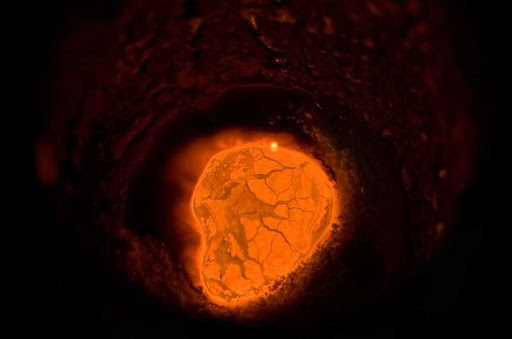 Molten gold and flux used to remove impurities glows red hot as it is melted in an induction melting machine at Dvir & Stoler Refining in New York, U.S., on Monday, Jan. 4, 2010. Robert Stoler pours molten gold into an ingot mold at Dvir & Stoler Refining in New York, U.S., on Monday, Jan. 4, 2010. 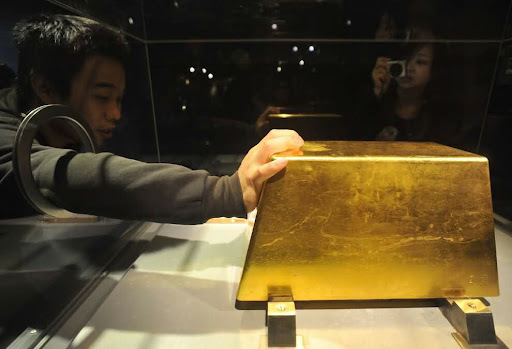 Gold bars are pictured at the Ginza Tanaka store in Tokyo October 23, 2009. A goldsmith works on a gold ornament at a workshop in Chandigarh, India on November 23, 2009. 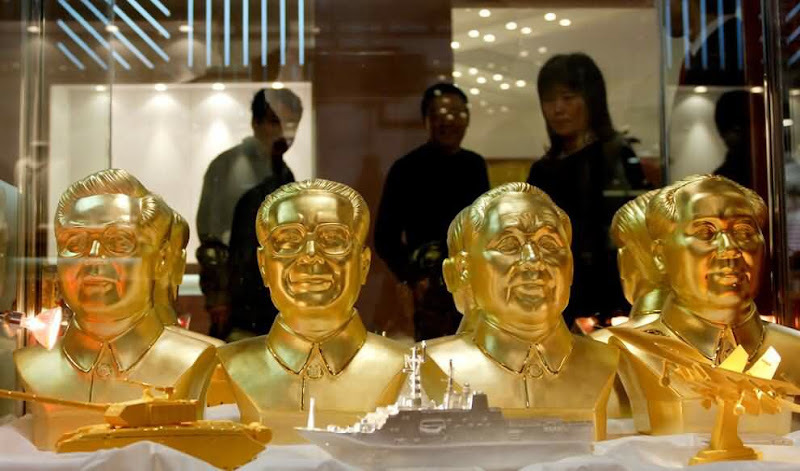 Gold busts of (l-r) Chinese leaders President Hu Jintao, former president Jiang Zemin, late patriarch Deng Xiaoping and Mao Zedong, are displayed at a gold exhibition in Beijing, China on November 8, 2009. 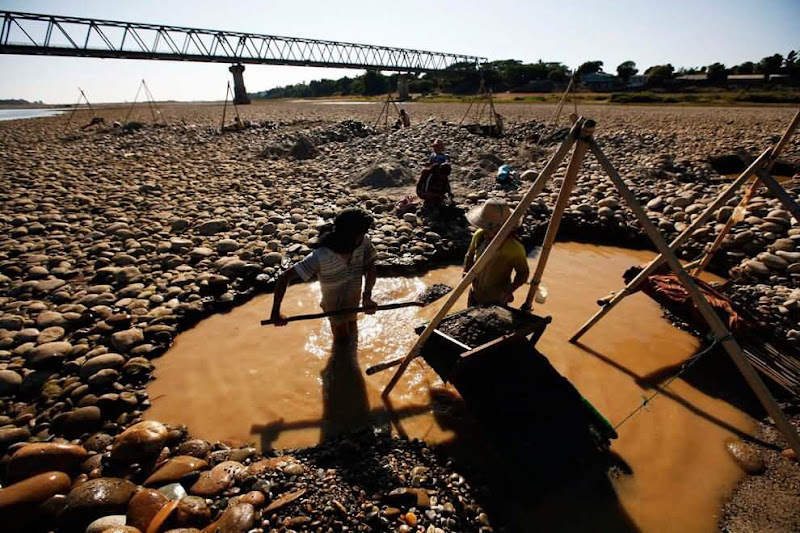 Villagers use tools to pan for gold from the Irrawaddy river near Bahalminhtin Bridge near the town of Myitkyina in the northern Myanmar on January 7, 2010. 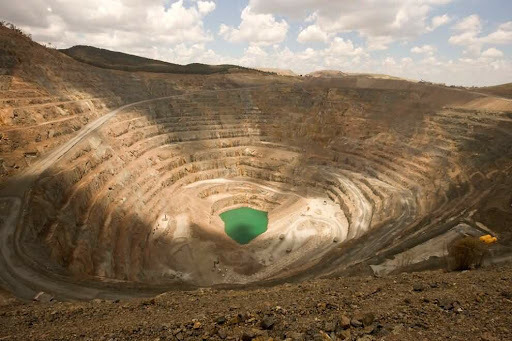 An overall view of the open pit gold-copper Cadia mine in Orange district in Australia on January 8, 2010. Pure gold casting grain is displayed for a photograph at Dvir & Stoler Refining in New York, U.S. on Monday, Jan. 4, 2010.